Preheat the oven to 375°F. Spray a baking dish with olive oil. Rinse the tilapia under cool water and place in the prepared baking dish. Whisk together the lemon juice, olive oil, garlic and capers. Pour over the tilapia. Season with salt and pepper. Slide the baking dish into the oven and bake for 15-20 minutes, until the fish flakes easily with a fork. Serve immediately, spooning the liquid from the pan over the fish and topping with lemon zest. When my daughter saw me preparing tilapia for a meal recently, she let out a shout of glee. She loves fish, and even more so when it has a fabulous, tangy citrus-taste. But more on that in a minute. I always find it so interesting how polarizing fish can be. Though fish has caught on because of its health benefits, many people still have very strong love or hate feelings for it. Mentioning it can either bring a big nod of acknowledgment or a serious face-altering grimace. My kids and I fall in the love category, and my husband tolerates it (yes, there is a grey area too). But as far as fish goes, tilapia is like Switzerland. It’s a mild white fish that is easy to season and can be manipulated into different flavors. Unlike salmon, which has a bold and decisive flavor, tilapia is just a simple fish. 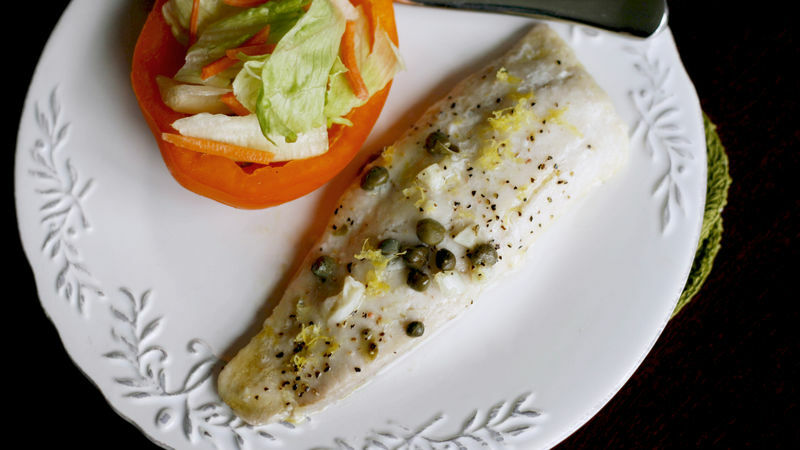 That’s what makes tilapia the perfect fish for a dish like Lemon Caper Tilapia. Since it’s a mild fish, the simple lemon mixture that it’s cooked in becomes the essence of this dish. And with salty capers and a hint of garlic, it’s just perfect. This makes a perfect lunch served with a simple salad. Or you can dress it up a little by serving it over rice with steamed veggies. Be sure to hit the veggies with a little of the sauce from the pan too.